Access more than 2 Billion customers. Learn how with Facebook ads. Facebook is one of the most popular social media sites to advertise one’s business, and for a good reason: it has more than two billion active users, a wealth of user data, and numerous ad formats. In the age of social media where nine in ten people check their phones an hour after waking up in the morning, Facebook advertising is the perfect complement to your advertising strategy. 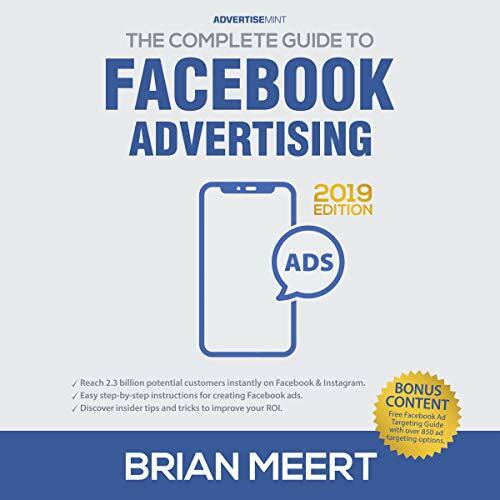 In The Complete Guide to Facebook Advertising, Brian Meert teaches you how to advertise on Facebook. He walks you through step-by-step guides and easy-to-understand explanations. Additionally, he provides free resources and tips on how to create the perfect Facebook ad. Small business owners will learn how to run successful Facebook ad campaigns. With this audiobook you will reach two billion potential customers instantly on Facebook and Instagram. Follow easy, step-by-step instructions for creating Facebook ads. Discover insider tips and tricks to improve your ROI. ©2019 AdvertiseMint, Inc. (P)2019 AdvertiseMint, Inc.